Get out and ride in the Alaskan Boreal Forest! Traveling at speeds up to 30 mph, maneuver through the taiga to picturesque panoramas of the Alaska Range. Observe glacial moraines and historic archaeological dig sites while navigating tree rutted trails, mountain-fed creek beds, and boggy tundra. 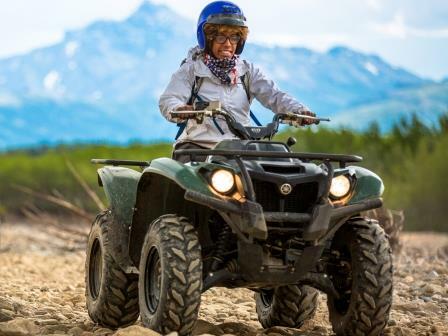 Spend more time riding on the trail than any other Denali area off-road adventure tour. You may learn how to make fireweed tea, leave with a blueberry smile, or even chat about survival. Periodic stops are made for photography and wildlife sightings. Tackle the terrain in a single-rider ATV or share the thrill in a multi-passenger side-by-side ATV. Trails are challenging for all experience levels. Total tour covers about 20 miles with 2½ hours on the trails. 3½ hours from pick-up to drop-off. Total tour covers about 20 miles with 2½ hours on the trails. *Side by Side ATV prices based on full occupancy - 4 riders. Add a 5th and 6th rider for only $75 each!